Welcome to the FINS! This document is designed to introduce new families to our team and reacquaint returning families. Once you register for the team, be sure to sign up at www.RCFins.com, the team website, for the most up-to-date information throughout the summer. Only team members have access to the website. Your Team Representatives are Fred Baechli and Geoff Plague, and you can contact us at TeamReps@RCFins.com if you need any assistance or have additional questions. Your Head Coaches are (right to left) Sarah Ockenhouse and Katherine Karson. You can contact them at Coach@RCFins.com. Sarah and Katherine are joined by Assistant Coaches Kaitlin Klumpp and Evan Judge. We are a summer-league swim team open to all Rock Creek Pool Equity Members and those on the wait list with full Summer Swim privileges, ages 5-18 (pre-team swimmers may be younger). The Fins are part of the Montgomery County Swim League (MCSL). The team experience of hanging out with, cheering for, and being cheered on by kids of all ages. Learning that if you work hard at something, you really can get better. Lots of opportunities to have fun at meets, practice, and through a ton of great social events. Hanging out with the coolest kids and parents at the pool. Does my child have to be a fast swimmer? No, all swimmers are welcome! At the start of the summer our coaches will screen younger swimmers to determine whether they’re ready to compete in meets, or if they need more focused instruction and development. Those swimmers who are not quite ready for meets will participate as a member of either the Pre-team or Future Fins, depending on his or her skill level. All swimmers, regardless of whether they are ready to compete in a meet on Day 1, are part of the team, and are encouraged – along with their families – to take part in all the fun activities throughout the summer. Will my child (and I) have fun? Of course! That is the whole point of summer swimming. A few social events of note… Friday night pasta parties, treats after Friday morning practice, swim banquet to celebrate the end of the season, lunch together after home and away Saturday meets, swim-a-thon and pancake breakfast at the end of the summer, intra-squad meet, Relay Carnivals, the trip to Beaver Dam… and more! Team fees, payable by June 6, are $145 for the first swimmer and additional swimmers may be registered for $100 provided they are registered at the same time the first swimmer is registered. If additional swimmers are registered in a separate transaction, the fee is $145. Do not pay until you are certain your kids will join, because fees are nonrefundable. Fees are the same whether your child is competing in meets, swimming on the pre-team, or learning his or her way around the pool as a Future Fin. Swimmers who are not certain about joining the team may attend practice for a few days and then decide. In 2018 practice starts Tuesday, May 29, including a swim test to determine placement of new 8-and-under swimmers. Time trials will take place on Saturday, June 9, followed quickly by our first B meet on Wednesday, June 13 and our first A meet on Saturday, June 16. The “regular” season runs through our B Relay Carnival on July 18, with Divisional Championships and other post-season meets through July 29. Where can I find the team schedule? On this website and on the team website, www.RCFins.com. The Fins practice daily during the week, and swimmers are encouraged to participate in as many practices as they can. Please note there are no evening practices on Wednesdays (B meets) or Fridays (team pasta parties). What are my volunteer commitments as a parent? We ask every family to volunteer for at least part of each meet in which you have a child swimming. 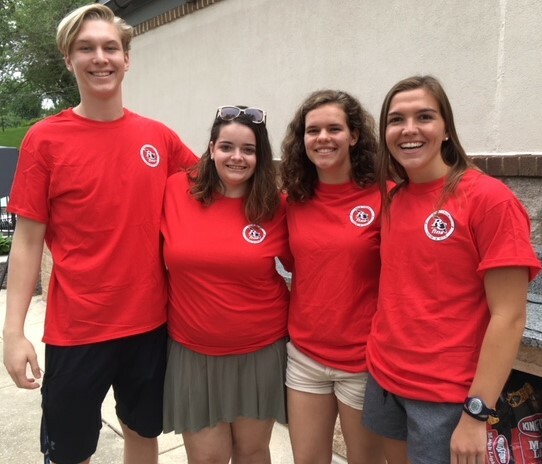 There are a lot of choices for volunteering: lining swimmers up in their lanes, timing, officiating, entering times, filling out ribbons, selling spirit wear, selling concessions – the list goes on. All jobs are fun and easy, and we need everyone’s help! Who are the team coaches and how can I get in touch with them? As mentioned above, the Fins will be coached this year by Head Coaches Katherine Karson and Sarah Ockenhouse, and Assistant Coaches Kaitlin Klumpp and Evan Judge. You can meet the coaches at the informational meeting on May 28, and the Head Coaches can be reached at Coach@RCFins.com. Who are the Team Representatives and how can I get in touch with them? Fred Baechli and Geoff Plague are the Team Reps. They can be reached at TeamReps@RCFins.com. The Pre-team provides swimmers who are not quite ready to compete in meets the opportunity for specialized skill development and stroke instruction from the coaching staff. The goal of pre-team instruction is to have swimmers ready for to compete in a meet by the end of the summer. Future Fins is a swim lesson program for swimmers not yet ready for Pre-team. The focus is on developing basic swim competencies and beginning to teach proper swim techniques. 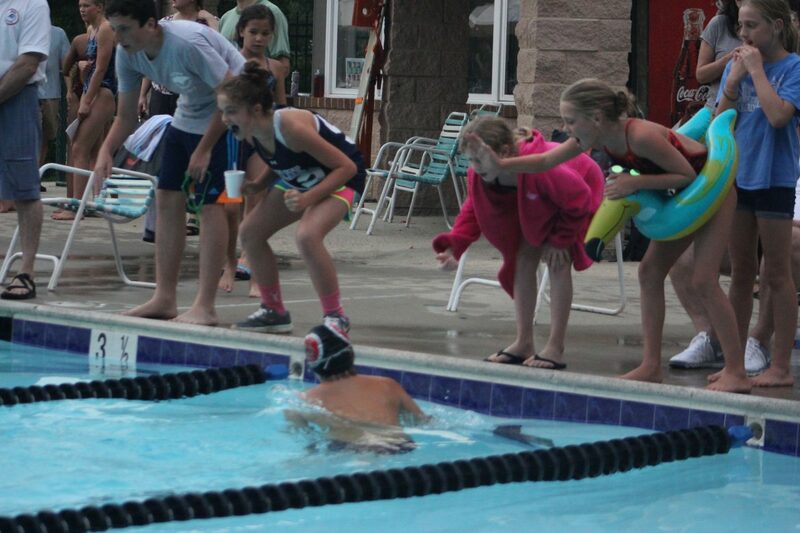 Future Fins are as much a part of the team as those swimming in A and B meets and Pre-teamers. They are, after all, the future of the RC FINS! What are “A” and “B” meets? A meets are the official MCSL-scheduled summer swim meets, and they are conducted in strict accordance with MCSL rules. The five summer A meets take place on Saturday mornings, and the results are used to determine division assignments for the following summer. Generally, there is a single heat for each event and the three fastest swimmers in each stroke compete in A meets. A swimmer may participate in up to three individual events in an A meet. A meet times are used to determine eligibility for Divisionals, as well as the end-of-year Individual All-Stars meet. B meets are less formal Wednesday meets which are organized and scheduled by the team reps. All swimmers participate in B meets, though a swimmer may not compete in an event he or she swam during the preceding A meet. There are generally multiple heats for each event. How will I know if my child is swimming in an “A” meet? The lineup is posted on the team site, usually the Friday morning before the meet. The divisional championship meet is held at the end of the season against the five other teams in our Division. What Division of MCSL are we in this year? Division G. The other teams in our division are Forest Knolls, Lakelands, Manchester Farm, Old Farm, and Westleigh. What is a “Relay Carnival”? A special multiple-team meet comprised only of relay races of all sorts – some within age groups, some across age groups, and even some where the boys and girls compete together. The A & B Relay Carnival meets in which we participate are always among the highlights of the summer. Loads of team spirit and a ton of fun! Each year the team goes to this quarry outside of Baltimore for even more swimming … with a rope swing, rafts, cliffs to jump off, and various other fun things to do. Do I have to dye my hair red to show my Fins Spirit? No … but team spirit is definitely required!